#tdil the reason for the order in which wolf packs roam around. as in, how they decide who is upfront, who goes in the middle and who lags behind at the back. the silver lining in all this is that i’ve ended up learning the real order of the pack and the reason that wolves always walk in a single file line when navigating snow. so, lets answer the quick bit first – why wolves walk in a single file line when navigating through snow 🤔. that actually leads us onto the next bit quite nicely. 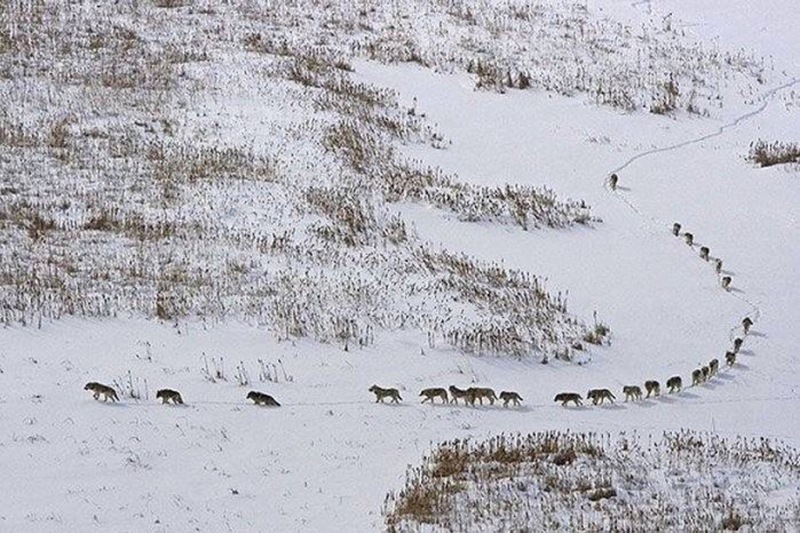 the linkedin post that i saw mentioned that the sick and elderly wolves would walk at the front of the pack so that they could set the pace. considering we just discussed how hard it is to walk in snow … how would that even make sense?! nope, wolves don’t actually make the sick and elderly forge the path at the front of the pack 😒 instead, the guys at the front are usually the leading wolves in the pack – the leading wolves are usually the breeding pair. these pack leaders are fit and healthy wolves that will have no problem slogging their way through deep snow and ensuring that there’s a decent path for the weaker wolves in the pack🐺. if you have seen the post that i’m referring to, then it might be worth me mentioning the story behind it 😅 the internet is rather annoyed at it. so, originally, the photo was taken by david attenborough (aka god) and depicts a wolf pack that is much bigger than they usually are. this particular one was out hunting bison … the usual 10 wolves in a pack can’t take down a huge bison but this pack of 25 could 💪.